Want to create solutions to urban problems in DF? 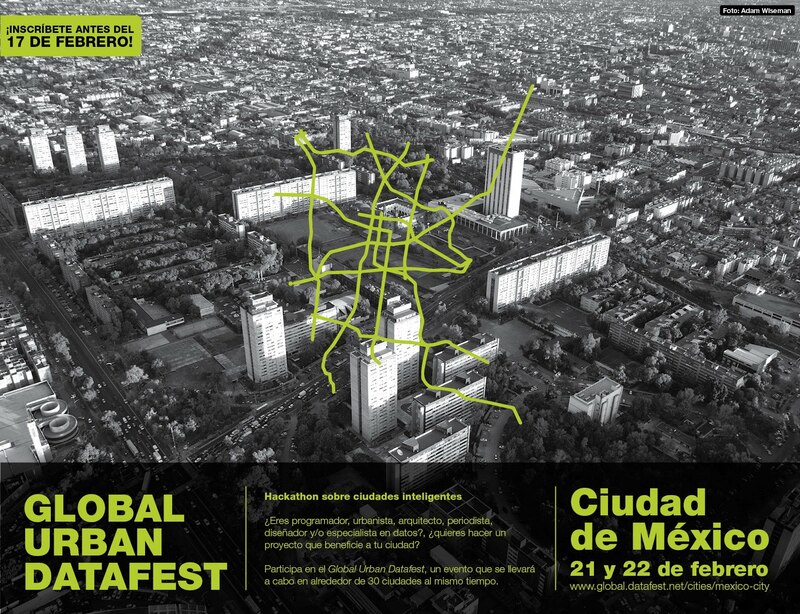 Join us for a two-day global hack where participants will be brainstorming ideas, creating prototypes and presenting their ideas on urban improvements in Mexico City. Interested in taking part? If you are a programmer, designer, journalist, academic, urban planner or are simply interested in improving your city then please join us. Global Urban Data Fest welcomes participation from multidisciplinary teams. Sunday 22 February - Presentations, tlayudas and mezcal! Dulce Maguey - Cozumel 60, Cuauhtémoc, México, D.F. Two winning teams will go on to compete against 20+ teams from across the globe. Prizes will be announced at a later date. Infogram is a esay and beatifull data visualization product. Infographics and charts are quick to use, fast to share, and easy on eye. Works with a customers range from small businesses to global media organizations, and it's been awarded multiple times during his short but fast-paced history. Detective.io is a tool for collaborative network analysis. It lets users create a specific data structure that fits their investigation and provides them with an easy-to-use front-end. It was used on several cross-border investigations, such as [The Migrants Files](http://www.detective.io/detective/the-migrants-files/) and [The Belarus Networks](http://www.detective.io/detective/belarus-networks/). Detective.io is used by newsrooms and NGOs across the world to investigate police violence, think-tanks, lobby groups, corporate behemoths and more. Detective.io creates a custom API for each data collection a user starts. It makes it extremely easy for a developer to build a custom interface from a data collection, as was done by NGO Global Witness on the [Great Rip-Off Map](http://greatripoffmap.globalwitness.org/). *Relevance: The visualization must use the network to shed light on an issue (e.g show that a person is a bridge across several groups, show that a company owns a myriad of other entities, show that a location is key to several events etc. ), as opposed to bringing together a heap of data. *Originality: Networks aren't only for company ownership and interpersonal relationships. Any activity or thing can be described as a network, such as events, locations, academic research and more. *Sources: As much information as possible must be sourced. An applicant can submit as many visualizations as he or she may like. The visualizations filed can be made with the help of one or more collaborator. If this is the case, only the person that owns the visualization is awarded the prize. Detective.io will reward the best network visualization with a one-year access to the most premium features of the product. A [step-by-step tutorial can be found here](https://github.com/jplusplus/detective.io/wiki/Tutorial---The-Carlos-Slim-network). The [API documentation lives here](http://docs.detective.io/en/latest/common.html). He researches and promotes ICT for Social Change projects in Latin America. He is the CEO and co-founder of SocialTIC, a non-profit that enables changemakers though the strategic use of ICTs. Juan Manuel has managed, trained and advised NGOs, Governments and multinational organizations on the use of ICTs for transparency, accountability, advocacy, citizen participation, open data, digital security and privacy, open culture and digital citizenship throughout Latin America. ICFJ Knight Fellow working with media organizations to innovate in data and investigative journalism. Juan Manuel has a M.C. degree in Management and Implementation of Development Projects from The University of Manchester and a B.S. degree In Industrial and Systems Engineering from Instituto Tecnológico de Monterrey Campus Estado de México. He has 15 years of experience in civil society sector in Mexico participating in development, education, environmental and ICT4D projects. For the private sector he served as consultant for Accenture for corporate strategy, operations and project/program management. Lecturer and researcher at Universidad Autónoma Metropolitana-Cuajimalpa since January 2009. Maria studied her PhD at the University of Reading, UK. She is member of the National Research System since 2003. She has published in different periodicals such as Visible Language, Tipográfica, Digital Creativity, Print and Information Design Journal. Her research interests are related to Information Design mainly, on issues such as legibility, users´experience, transforming complex data into clear, simple, efficient and attractive information, and Information Design with social responsibility. Maria has just finished writing her book Information Design and Everyday Life which will be published by Editorial Designio in this year. Journalist. Cofounder in 2011of Data’n’Press a data journalism and big data analysis studio. Master in Investigative, Data and Visualization Journalism with a Google Excellence Scholarship. Creator of the Data Journalism section of El Periódico de Catalunya. Collaborations: Bill and Melinda Gates Foundation, Pomepu Fabra University and El Universal among others. Currently Who’s Who Wiki coordinator. Master of Architecture in Urban Design, Harvard University Graduate School of Design, 2014. Diploma in Public Space and Safer Cities, Universidad Iberoamericana, 2011. Trained as an architect by Universidad Anáhuac, Mexico City,(2005). Victor is currently Chief of Strategic Projects of Mexico City’s Public Space Authority. He is also co-founder of, [A-RU] (Urban Resilience Agency), amultidisciplinary NGO that takes on urban planning and design, public administration, territorial ordering, economics and the environment in order to increase territorial operational capacity while searching, through innovation, for the mechanisms and instruments that contribute to better decision making in socio-spatial inclusive developments in Latin America. Within [A-RU] he worked as a consultant for Mexico City’s Secretariat of the Environment (SEDEMA, D.F. ), for the Rockefeller Foundation’s Centennial Initiative: 100 ResilientCities. Previously he worked for IDEURBAN and Becker Arquitectos, two of Mexico’s most prominent construction contractors. Following that, as an independent associate he executed a series of architectural and urban design projects, at multiple scales (2005 – 2012). Please invite people using our flyer!